You’re creating a document with Word that you want to turn into a nice full-page PDF. It has a gorgeous background color that will look great. But every time you convert it to a PDF, it ends up with ugly white borders at the edges, and Word warns you about printing beyond the printable margins. Dragging the margins and changing the Page Setup options does no good. How can you fix this? 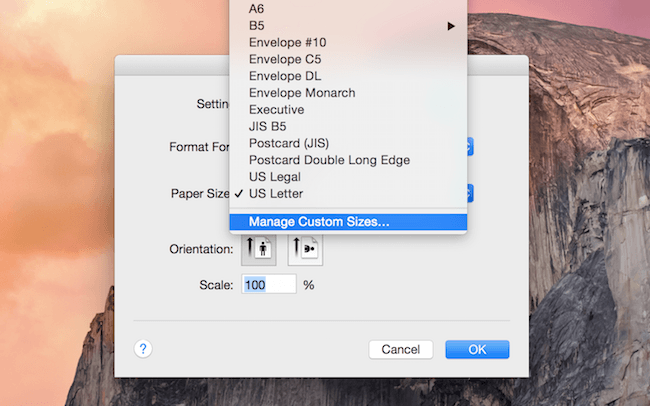 Go to “File > Page Setup.” In the “Paper Size” dropdown menu, select “Custom Paper Sizes.” Here’s what that looks like in a Mac. 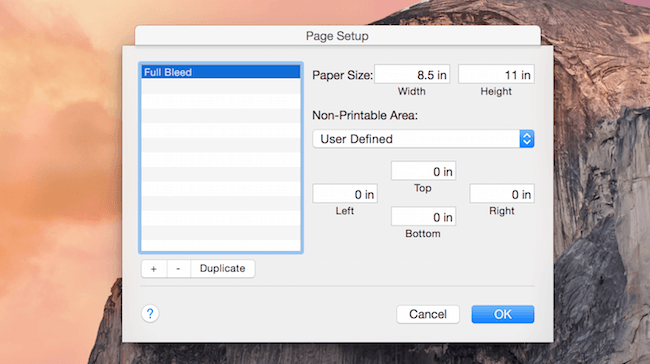 Now add a new paper size, and call it “Full Bleed.” Set the non-printable area to 0 on all sides. Here’s what that should look like. Now you’re done. Your PDF document will look just as you see it in the visual preview, including background colors and other elements that reach the edge of the page.